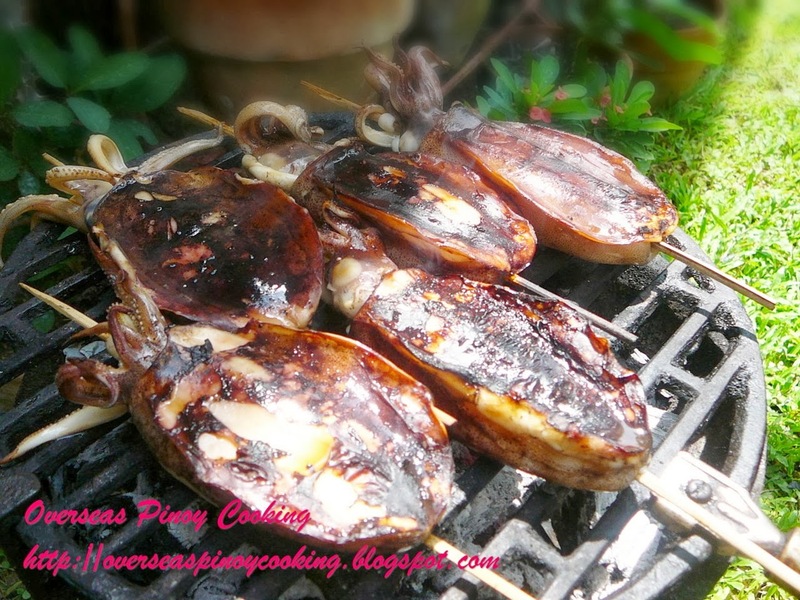 Inihaw na Pusit is one of the most ordered food in any grilled seafood restaurants and fassfoods or foodcourts. I myself have been ordering inihaw na pusit before until I was feed up on the quality of restaurant's inihaw na pusit. Most of the time their inihaw are not fresh or have been pre-cooked and of course overcooked to the point that the squid meat is like rubber. To have a soft and succulent grilled squid it should only be grilled or cooked briefly otherwise the meat will be hard as rubber. Can you imagine a half cooked un-fresh, bilasang pusit, and the rip-off prices these restaurants are charging for their un-edible grilled squid. 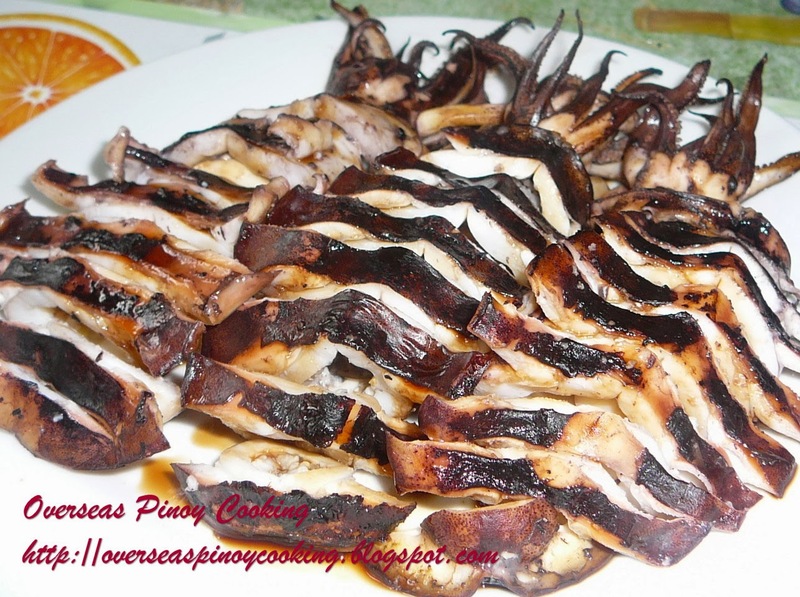 If you could spot a really fresh squid on the fishmarket don’t think twice buy it and have a really fresh home cooked inihaw na pusit and here is how to do it. To clean squid, pull out the head and the innards will come out with it. Discard entrails. Remove the teeth and keep aside head and tentacles. Remove the membrane from the body. Wash out remaining entrails under running water and drain. 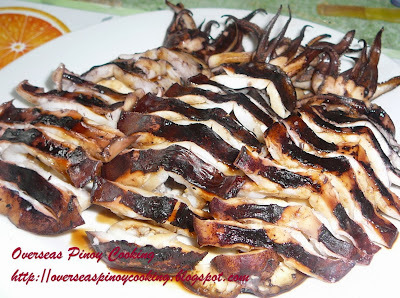 Marinate squid in a mixture soy sauce, sprite or 7up, kalamansi juice and some cracked peppercorns for 30 minutes to 1 hour before grilling. Drain marinade from the squid and keep aside marinade. Using large bamboo skewer string each with head in place. Grill squid about 4-6 inches above charcoal for 4 to 5 minutes on each side. Baste squid with the marinade in between. When done slice each squid crosswise and serve with your favourite dipping mixture. our dad past away this last month... and as the eldest family member in the house, i am obligated to learn how to prepare foods. and now i bought a kilo of pusit this morning for our dinner. and lucky me found this blog, and learn something new. I'm happy that this site keep on helping a lot of people. The membrane I was referring to on the recipe is the plastic like backbone :) If you are refering to the squid skin membrane personally I would prefer my inihaw with skin on this will protect the meat during grilling.